What comes to mind when you hear the word "Celtic"? Hopefully not a mispronounced sports team, given this crowd. Maybe Irish crosses? Medieval metalwork? Some darn good fiddle-playing? All of those are valid. But being the filk geek that I am, I tend to think of Heather Dale. A powerhouse in the filk community, the Society for Creative Anachronism, and far beyond, Heather Dale epitomizes the Celtic folk spirit. She bills her music as "Modern Celtic," and you do hear some electric guitar, synthesized instruments, and jazz influence in her recordings. 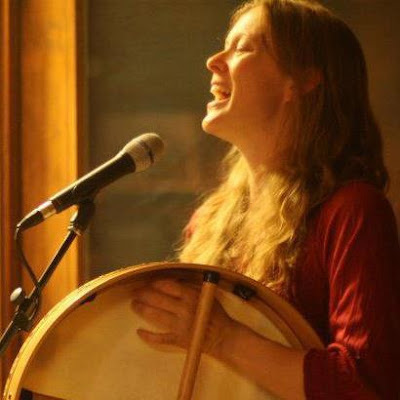 But to me, she is easily the most true-to-form, lively, and heartfelt Celtic filker out there, bodhran at the ready. (A bodhran is an Irish hand drum.) 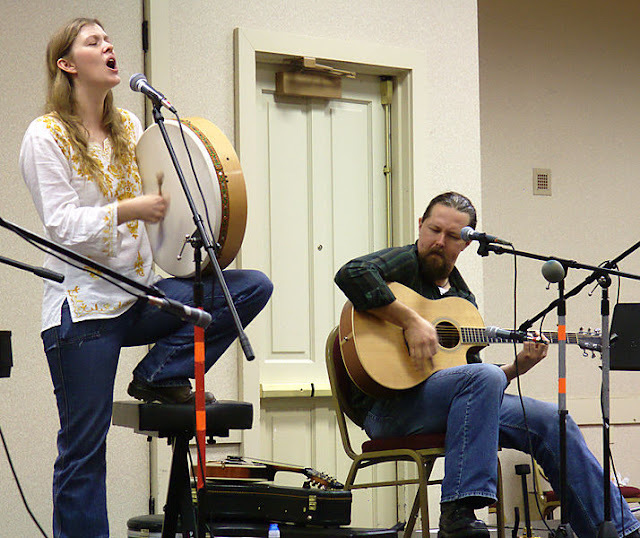 Here she is at the Ohio Valley Filk Festival (OVFF) with her frequent performance partner, Ben Deschamps. Heather infuses every song she writes with a sense of majestic days gone by, whether the subject is ancient, medieval, or timeless. She has won several Pegasus Awards in different years, including Best Romantic Song, Best Performer, Best Writer/Composer, and Best Filk Song for "Joan." Her eminently singable tunes are a joy to listen to, like this mesmerizing performance of "The Maiden and the Selkie" with members of her group, the Heather Dale Band. Perhaps she is best known for her song cycle about Arthurian legends, specifically the haunting song "Mordred's Lullaby." It has over 12 million views on YouTube, which is a very big number. While I love this song to pieces for its unusual insight into the tragic character of Mordred, I am also a huge fan of less-discussed songs like "Kingsword" and "The Prydwen Sails Again." In these two songs, she seamlessly blends traditional and modern sounds to create something all her own, and it is fantastic. Not limiting herself to Celtic folklore, Heather dips her toes in all sorts of mythical waters. You can find Norse and Greek mythology, medieval history, and even a song about Baba Yaga in the mix. Below is the Heather Dale Band performing "Sedna," a tale of the Inuit ocean goddess. In terms of technical know-how, Heather is a Renaissance woman. In addition to singing and playing the bodhran, she puts her skills with several other instruments to good use. Those instruments include the harp, alto recorder, two kinds of dulcimer, Irish flute, bowed psaltery, and of course, the piano. While I'm bombarding you with gorgeous YouTube videos, here's the official music video for "Fortune," a carpe diem song for voice and piano in classic Heather style. Let's not forget that Heather also produced her own musical, Queens of Avalon. (Yes, you read that correctly.) She describes it on her website as "the famous story of Camelot, but surprisingly reinterpreted from a woman’s perspective." She's also a plain old fun and friendly person, and I'm glad I've had a few chances to talk to her. I hope for many more. Who is your favorite Celtic-inspired singer? Let us know in the comments!